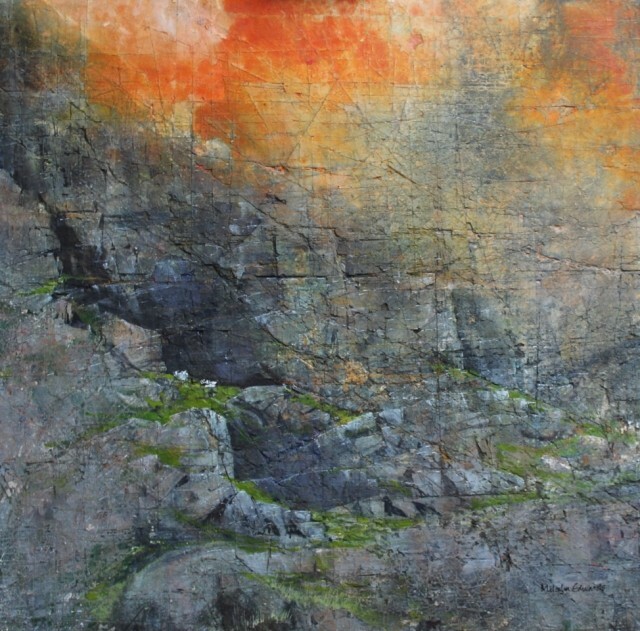 "The mood and drama is paramount and I want the viewer to be compulsively struck by the thought that it could only be Wales even if the image or a large portion of it is non representational, this means that the abstract must support the idea. There is obsession with the textures and forms of the buildings and landscape riven by the corrosive forces of wind and rain, and with the fickle changes of light and shadow on faceted surfaces. It seems natural that the medium is predominately water based, sometimes in a traditional manner but more often in a new more adventurous and unconventional style, as this reflects the way the elements were created. Capturing these textures involves constant experiment to exploit uneven drying combined with frequent washing out, and the staining quality of some pigments. Water colour is considered difficult and subject to punishing vagaries, more positively the accidents don't happen ... they are created. Out of the chaos of grainy texture, judicious darks suggest the reality of the subject." The power and popularity of Malcolm's work is not explained merely by his ability to capture these massive landscapes for us, combining forensic accuracy and documentary clarity with a strong sense of drama. There is more here: a dialogue between visions of permanence and decay, a sense of the stoic acceptance of the passing of time, and a yearning melancholy. His skies now often seem studded with birds, swooping or riding the currents. Malcolm Edwards paintings are in collections in USA, Canada, Mexico, Australia, Sweden, Bermuda, South Africa, France and Germany and have also been purchased by Rolls Royce; The Contemporary Arts Society for Wales, Aberystwyth; and The Clwyd Fine Arts Trust. Malcolm has had successful exhibitions with us in 2013, 2014, 2015, 2017. We are very glad to annouce Malcolm will have another exhibition with us in March 2019.